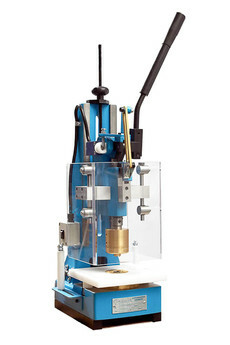 The EP3 manual eyelet machine is a light hand-operated (manual) press. 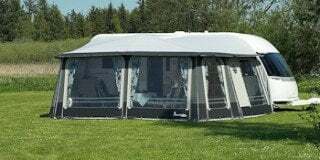 It has been specially designed for tarpaulin producers and banner suppliers using one or more eyelet sizes in the tarpaulins. The EP3 manual eyelet machine is extremely flexible and versatile. It can be used with both punching and non-punching electrodes. The press has been constructed in such a way that electrodes can be exchanged very easily. Eyelet-sizes or geometry can be changed in a few minutes. The EP3 is easy and safe to operate. Punching and welding take place in one operation. The integrated toggle joint will lock the press during welding and cooling —leaving the operator with both hands free to prepare next welding. 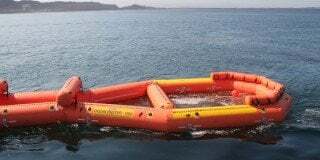 The punching force is so high that the operator can easily punch through 4 layers of reinforced plastic sheeting. the manual eyelet machine EP3 is equipped with a safety shield. The press must be connected to an HF-Generator with a coax-cable (2.5 – 3 kW recommended). These machines are designed, hand-built and tested in Denmark, offering superb quality and durability.